Due to work starting on creating a direct road link between Heysham and the M6, the Way of the Roses route is being affected in two places. Later this year, a temporary diversion away from part of the greenway route leading into Lancaster from Morecambe will be signed to accommodate bridge widening works. On the other side of Lancaster a new bridge is being built over the River Lune and the usual riverside route will be closed for up to two years from the end of February. 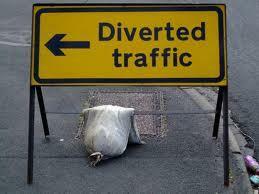 A short diversion route is being constructed.